Now that Silverlight 2 has been released .NET web developers can begin writing rich Internet applications in languages like C# and VB.NET which they know and love. However if you have spent the last few years developing web applications using ASP.NET you may have developed certain habits that will not serve you well in when writing Rich Internet Applications. Undoubtedly one of those habits is avoiding state. Sure you could always use the view state or worse, the session state to store information across page loads. However it's generally advisable to use as little state as possible to maximize the scalability of your ASP.NET applications. It's important to unlearn this behavior now that Silverlight 2 has been released. Repeat after me: "State is good." Client state, this is. Modern hardware is fast and memory is cheap. Part of building rich Internet applications is leveraging all that juice to transform what users expect from web applications. Of course this calls for a very different set of design patterns than the ones we use to build stateless applications. In the RIA world it is no longer necessary, nor efficient, to destroy and recreate objects all the time. However if we keep objects around a long time we run the risk that they will get into inconsistent states. An example of this problem is an application not updating the status bar and disabling the "Save" menu item when a new file is loaded in a text editor application. The problem of synchronizing UI elements gets exponentially more complex as more UI elements are added. One way of keeping long-lived view objects synchronized with each other is to design an observable model. Many of your favorite MS applications (ex. Visual Studio, Office) use this model. I'm not going to explain the observable model to you in detail because it has been explained very well by others already. To summarize, in an observable model view objects subscribe to model objects and are responsible for updating themselves when the model changes. It sounds simple but it is a very powerful way of managing complexity in UI's because you can add new types of view objects without touching the code in either the model or the other views. In this blog post I want to show you how to create an observable model in Silverlight. Let's use Silverlight Charts as an example, partly because it's a simple example of an observable model in Silverlight and partly because I just spent the last three months working on it with Delay (and others) so it's fresh in my mind. The Silverlight Chart has a collection of axis controls, series controls, and a legend control with a collection of UIElement's. All of the elements in the various collections have to be inserted into the Chart's (or Legend's) visual tree. The Chart (and Legend) needs to detect changes to their collections and add or remove the UIElements from visual tree accordingly. Obviously the controls also need to be removed from the template parts when they are removed from the collection. In this case the collections make up the model and the Chart and Legend's panel template parts are the views. When the Series observable collection is changed the Chart responds by synchronizing the objects in the collection with those in the SeriesContainer template parts. 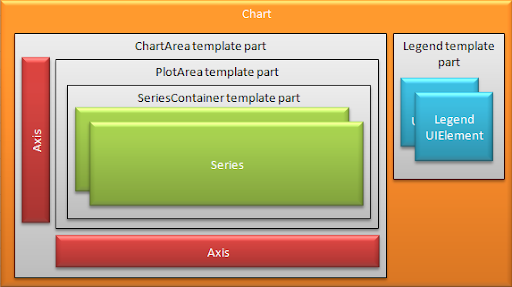 Although not shown above there is another template part behind the SeriesContainer called the GridLinesContainer. This is where the grid lines control associated with a particular axis are inserted so that they appear behind the series. The axis exposes the GridLines control it wants inserted into the GridLinesContainer via it's GridLines dependency property. The Chart must detect changes to this property and ensure that the control exposed via this property is inserted into the GridLinesContainer template part. You're probably already familiar with INotifyPropertyChanged. Implementing this interface allows a object to signal to the UI that it has changed. Although it might look like this would be the interface to use it is not appropriate in this case. Since axis is a control and its GridLines property is a dependency property, a more appropriate way of exposing changes to it is to expose a DependencyPropertyChanged event of type DependencyPropertyChangedHandler<T>. 1. It is generic and is therefore statically typed. 2. It provides both information about both the old and new value. This makes it easy for the chart to find the old control and remove it. 3. It is a routed event which will provide more flexibility as Silverlight matures and incorporates more WPF features for handling routed events. Binding objects that bind to custom dependency properties (those that you create yourself vs. those that are native) are not able to detect when a property's value changes. As a result if you bind two custom dependency properties together the bound property will only be set once regardless of how many times the source property is changed. One way of overcoming this limitation is expose dependency property change events for the custom properties you would like to bind together and synchronize their values in the event handlers. The solution to this problem is similar to the previous one. Hook the property change events of several dependency properties and do your aggregation operations in code instead of inside of a value converter. It's like a guitar that is always in tune no matter how hard you thrash. While the aforementioned limitations do make it very difficult to create observable models declaratively, Silverlight provides the necessary interfaces and delegates so that you don't need to reinvent the wheel. Although you'll be writing more code in Silverlight than in WPF you'll still find that it's surprisingly easy. Now that you have some tricks to help you overcome the known limitations you should embrace this pattern so that you can deliver the rich UI's your clients expect without spending your weekends tracking down bugs at the office. It's very true, not only does Silverlight make state management much easier (actually, it becomes an almost none issue) it can also significantly reduce complexity and resource requirements for the server. Thank you for your interesting post. It's very disappointing that Silverlight's data binding model is so different to WPF. I'm interested in the last part of your where you suggest that you can get property changed from Silverlight objects by creating your own DependencyProperties. Do you have any ideas on how I might be able to get that to work? At first glance it appears this should work. One gotcha to look out for is that in certain circumstances you must convert the data type using a converter. In this case the Text property expects a string and you are attempting to bind it to a double. Try creating a value converter that does nothing but call ToString on the double and see if that works for you. Thanks for the suggestion. Unfortunately, my value converter only gets called once, when the binding is applied. After that it never gets called. It just appears to me that the internal DependencyProperties never return changed references outside of the Silverlight core, because thus far I have not managed to get it to work with any properties including simple things like selected item in a ListBox. It seems very odd to me because if you look at the binding expression code I would have expected to be notified. the silverlight TextBox has a bug where it only updates the binding when the control loses focus, unlike most if not all of the other silverlight controls, and you don't have the option to specify that the binding should update onpropertychanged. moreover your code snippet didn't specify a Mode. perhaps you meant to create a TwoWay binding? Agh! Looks like it's just what I want to use to observe a base Children property...but getting an error when it tries to attach the Binding to the static HiddenProperty. (line 6 or so). Says Binding is not a valid value for the property. I'm encountering the same issue as Stefan, the property changed callback method (e.g. OnHiddenAttachedPropertyChanged) is only being called once, when the binding is applied. It's never called again. Is there a solution for this? I get a "'System.Windows.Data.Binding' is not a valid value for property ..." unless I set the DP type to "typeof(object)". Looking at the code (thanks again Reflector), I can't see any way that a user-created DependencyProperty can ever accept an instance of Binding such that binding works. Back to square one for getting notifications, I think. The problem with INotifyPropertyChanged and all other nonsense is that it is SO, SO, SO INNEFICIENT AND BROKEN it is not the cure to anything updating and changing fast. Andy Roddick's signature babolat pure drive, Pure Drive Roddick Babolat wilson k six, features GT Technology combined with head microgel and prince-o3-tour, versatile and accurate cheap tennis racquets with unparalleled performance and incredible feel with less vibrations. Look ！The shirt for men's clothing,ed hardy clothing, The ed hardy clothes on each piece were created ed hardy shirts and is recognized globally for his technical brilliance and mesmerizing imagery.Short sleeves ed hardy mens and ed hardy womens , remember to check out ed hardy t-shirts because they are very popular in demand too!Combination with ed hardy sunglasses,very handsome. The button to break the conventional design of polo shirts, the depth of clear lines of wholesale polo shirts from the Department of V on the first gives the impression of a unique, tailor-made with dark-green Lacoste polo shirts with the color scheme of Red and the casual cheap lacoste polos, stressed a summer of non-traditional use of color, so that the overall shape ofralph lauren polo shirts is full of flavor. The classic black-and-white cheap ralph lauren polos with matching black-and-white striped discount ralph lauren polos elegant leaves the impression that the import of polo clothing and black shoes brighten even more people. polo ralph lauren integrates two types of luxury and leisure style, now more and more popular men’s “thin” burberry polos, most designers have sought to perfect the cut with “cutting” a bag of bones of the body ralph lauren polo shirts. It is amazing that a tight lacoste polo shirts with pencil pants, full of retro style with a European aristocratic culture of leisure cheappolos. In preparation for the purchase of a tennis racquetbefore, we must consider your financial ability to bear; On this basis, a further comparison, as far as possible, choose your tennis racket. Now a lot of cheap tennis racquet and more mixed materials, the proportion of mixed-use to control the stiffness of the tennis racquet discount and the shock-absorbing capacity, the more rigid cheap tennis racket, the swing more powerful force; but the relative resilience of the shock-absorbing capacity and discount tennis racket performance of talks on the easier it is for the wrist and elbow injury.